Take a Tour with the 2018-2019 Cloverdale Sculpture Trail Artists! Cloverdale enlisted Otocast to, again, create a narrated, audio, self-guided walking tour for the sculptures in the 2018-2019 exhibit. And best of all, the audio comes from the actual artists! 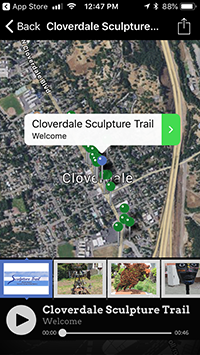 To enjoy the audio guide you download through Google Play or the Apple App Store the free Otocast app, which includes the Cloverdale Sculpture Trail. All the sculptures are displayed on an interactive map, with descriptions and directions from wherever you are, so you can easily explore the Trail. Sculptor information is available, including an image of each sculpture on the Trail. Press play and listen to the artist talking about his/her sculpture you are looking at.